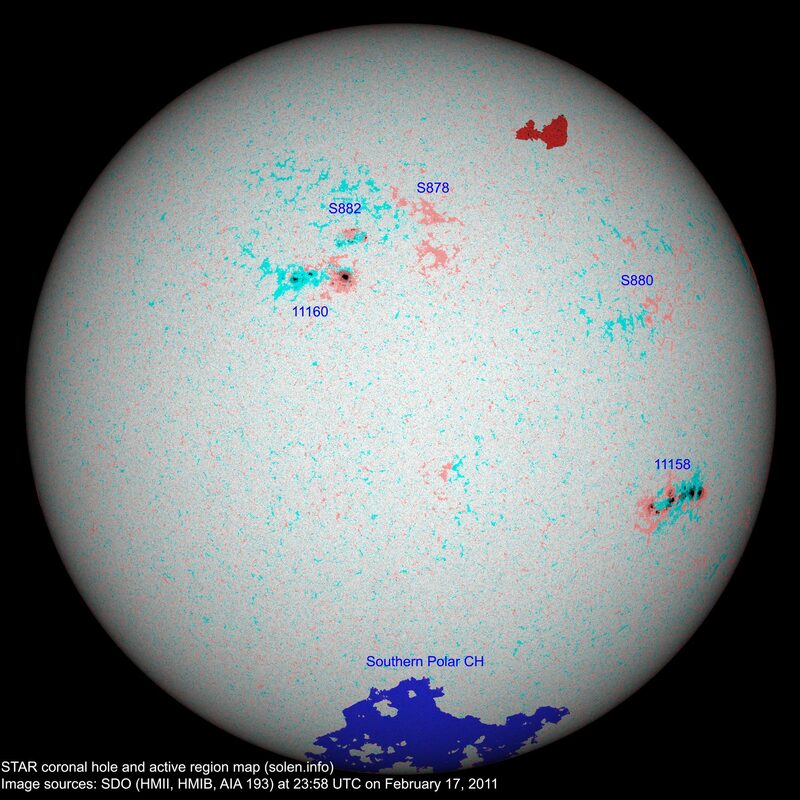 The geomagnetic field was quiet on February 17. Solar wind speed ranged between 300 and 348 km/s. 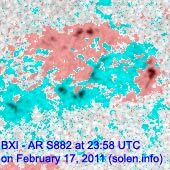 A solar wind shock was observed at ACE at about 00:40 UTC on February 18. 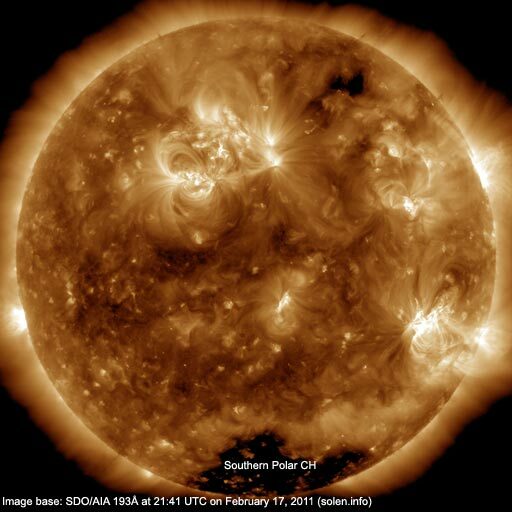 This was the arrival of the CME observed on February 15. 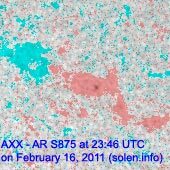 Although the arrival time was later than expected the total field of the interplanetary magnetic field is strong. 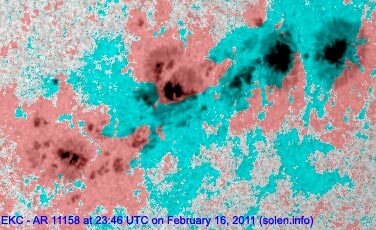 If the field swings fully southwards severe geomagnetic storming will be possible. The IMF has been predominantly northwards so far resulting in only a small disturbance as this is written. 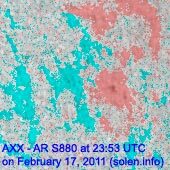 Solar flux measured at 20h UTC on 2.8 GHz was 110.9 (increasing 23.4 over the last solar rotation). The planetary A index was 2 (STAR Ap - based on the mean of three hour interval ap indices: 2.0). Three hour interval K indices: 00000111 (planetary), 00000122 (Boulder). Region 11158 decayed slowly. There is still a magnetic delta structure in a central penumbra, however, the delta is much smaller than it was a few days ago. There is still a chance of major flares. Flares: C6.1 at 01:46, C2.3 at 03:08, C1.5 at 04:15, C1.0 at 05:36, C1.2 at 06:47, C1.2 at 08:13, C1.9 at 09:30, C2.6 at 10:28, C2.2 at 10:44, C2.4 at 12:36, C1.3 at 15:54 and C1.1 at 21:35 UTC. Region 11160 (SWPC duplicate number is 11161) was quiet and didn't change significantly. 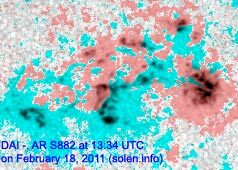 Minor updated added at 15:05 UTC: Region S882 has been very unstable and is still developing (see EVE movie). 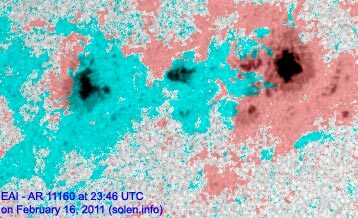 There's a magnetic delta structure in the center of the region and M class flares are possible. 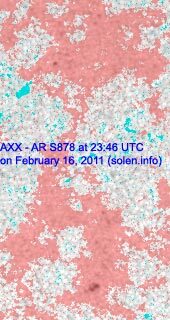 Either region 11158 or S882 was the source of an M6.6 flare at 10:11 UTC. 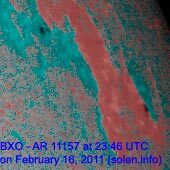 February 15: The X2 event in region 11158 was associated with a full halo CME. February 16: No Earth directed CMEs were observed. 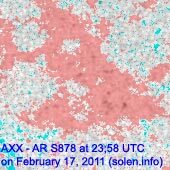 A filament eruption in region S878 around 06-07 UTC produced a CME off the northeast limb. 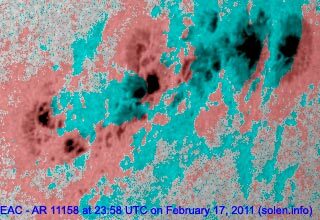 February 17: No obviously Earth directed CME were observed in LASCO and STEREO imagery. The geomagnetic field is expected to be unsettled to major storm on February 18 due to CME effects and quiet to unsettled on February 19-20.